I don't know what this says about me, but sometimes I love a really well written depressing novel. The kind that envelops you and makes you just feel lousy for awhile because you can't get the story out of your head because it's all just too much and hits too close to home. 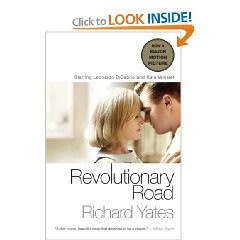 At any rate, Revolutionary Road was a really good depressing novel. Set in the 1950s, Frank and April Wheeler are unhappy Connecticut suburbanites that secretly yearn for anything else - by some end or another, they just ended up in the "white picket fence" lifestyle and they absolutely hate it. Frank feels stuck in a boring job in Manhattan and April can't escape being a plain old housewife and mother. This feeling of perpetual ennui is slowly strangling their marriage until April comes up with a "plan" to relocate to Europe. The sad fact is this plan merely exacerbates their crumbling relationship. I guess nothing good can ever occur when you pin all your hopes and happiness on something that's implausible. The final portion of the novel is absolutely heartbreaking. Even though it's completely fictitious, I felt such pity for these characters and their sad sack of a marriage. I still don't know what that says about me. Oh well. Did you know you can shorten your long links with LinkShrink and receive dollars for every visit to your shortened urls.